A 1994 2-CD compilation with notes by Bill Halvorsen. Percy Faith once described his desire to arrange music as “being in a constant state of pregnancy.” Known primarily for his arrangements of other writer’s compositions, he was troubled by the characterization of his work as merely “arranging,” as his arrangements were more accurately “recompositions.” Percy Faith was born in 1908 to parents who encouraged his study of music. Although the smell of rosin made him ill, he was encouraged to play the violin and later moved to piano. In a twist of fate, Percy’s little sister set her clothes on fire, and Percy burned his hands putting out the flames; while this temporarily left him unable to play, he was encouraged to continue the study of music, and to establish a firm classical background in music theory and composition. Mr. Faith was able to share with us his gift of arranging popular music for orchestra, through a long recording career with Columbia Records beginning in 1950. Prior to that he enjoyed an extensive career “on the air” in Canada. Mr. Faith brought a high level of orchestral sophistication to the radio. His opulent string sound provided not only a showcase for his own stylings, it provided an ideal background for his vocal guests and hosts. Many of the selections heard on this treasury were initially written (arranged!) by Faith during his radio days, then “updated” (minor changes, mostly in tempo and orchestration) for the “LP” days. He died in 1976, with several years remaining in his recording contract, a tribute to his lasting talents. The first half of Percy’s career was as a famous on-the-air arranger/conductor in Canada where the Canadian Broadcasting Corporation carried such rpograms as Streamline and Music by Faith. Percy rarely spoke on the radio; rather, he let his music speak for him. This background in radio is, perhaps, part of the reason that a Faith arrangement is so rich – he had years of experience dazzling audiences with his exciting orchestral sound in the radio days “on the air” before his recording career. Represented here are several lush tracks with a definite emphasis on strings. Also we hear Percy’s arrangement of Max Steiner’s Theme From A Summer Place, that won Mr. Faith not only a gold record, it earned him a Grammy and a chart topper status as well (the song never left the charts in 1960). We also hear an instrumental version of another Faith gold record, The Song from Moulin Rouge: due to his successful popular adaptation of the much longer original song. Several other songs, from various periods of popular music history, are represented here with the Faith orchestra, such as Kisses Sweeter Than Wine and Scarborough Fair/Canticle. Percy Faith’s album of instrumental versions of popular music from Broadway and Hollywood were proof of Percy’s theory that the public would enjoy repeated hearings of show-and-movie tunes divorced from the lyrics; we hear proof of his ideas in Bali Ha’I, I Could Have Danced All Night, Moon River, and Do I Hear A Waltz? From “Kismet” we hear Percy’s renditions of And This Is My Beloved, Stranger In Paradise, and Baubles, Bangles and Beads. Percy was a Canadian with a definite appreciation for Latin-influenced tunes – Malaguena, Besame Mucho and Delicado offer a glimpse of the excitement that Percy found in this music. We also hear some sparkling arrangements from an album that featured his stirng section and non-tuned percussion – My Shawl and I Get A Kick Out Of You. With strings, woodwinds, vocalize (the wordless female chorus dubbed “The Percy Faith Magic Voices” in earlier years), we hear some rich examples of an album from 1963 that featured especially rich versions of Moon Over Miami, Stars Fell on Alabama, and Carolina Moon. The essence of twenty-five years of recording, augmented by classical training and arranging for radio all the way back to 1928, can be heard in each arrangement. The quality of Percy Faith’s orchestral work is something we won’t forget and something that we can always enjoy through the magic of the compact disc. 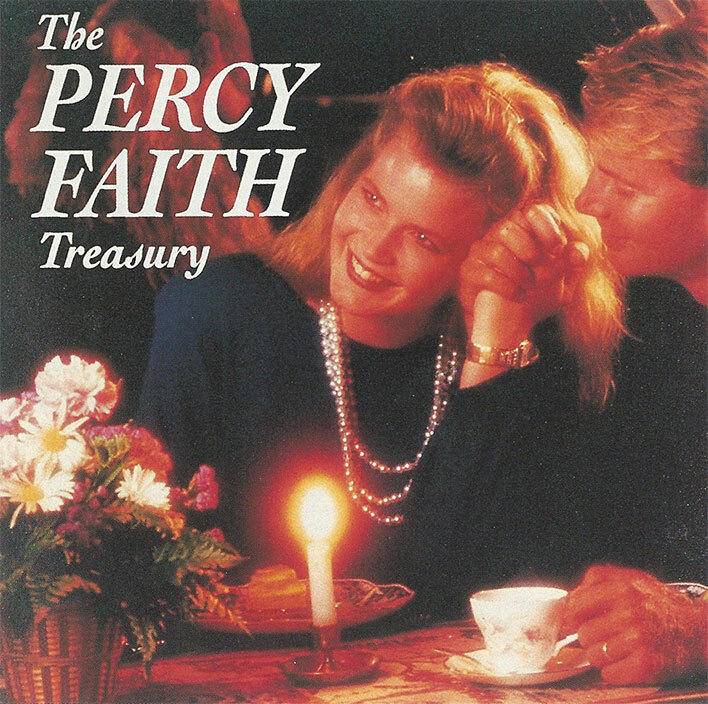 We most respectfully present the Percy Faith Treasury and know that you will enjoy many fine hours of listening.